This photograph from the archives is of the machine gun detachment of the 1st City of London Volunteer Rifle Brigade, better known as The London Rifle Brigade. It is recorded as having been taken at Aldershot in 1903. The London Rifle Brigade (LRB) was initially a Volunteer Rifle Corps formed at the same time as other corps in 1859. Between February and October 1900 five officers and 145 NCOs and men served as volunteers in the South African War. In the same year the LRB formed a machine gun detachment equipped with a single Maxim gun mounted on a large carriage, drawn by a horse or by a team of men – see photograph. The detachment was commanded by Lieutenant C. D. Burnell, a volunteer, who commanded 1 LRB in France at the end of the First World War. 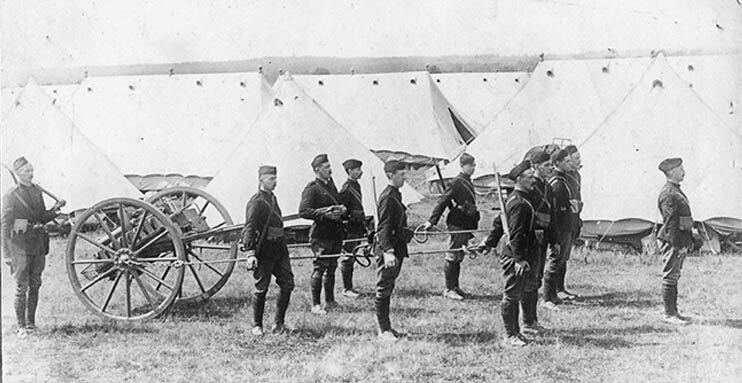 In 1903 the LRB spent Easter at a musketry camp at Bisley. It is presumed that the machine gun detachment trained separately at Aldershot where this photograph is recorded as having been taken. The LRB was re-titled the 5th (City of London) Battalion, The London Regiment (London Rifle Brigade) when The London Regiment was formed at the time of the creation of the Territorial Force in 1908. The LRB was affiliated to The King’s Royal Rifle Corps until 1908, and thereafter to The Rifle Brigade.